Our partner Puremix have been very busy producing lots of new tutorials that are fantastic for gaining new tips and tricks to add to your recording and mixing techniques. Improve your skills with these tutorials done by the leading sound engineers who worked on the hits you are listening to everyday. Many of you when picking up a plug-in at DontCrack have got in the habit of getting up a Puremix tutorial or two to benefit from our ‘Quantity Discount’. It’s a great way of getting the minimum price and maximum ‘use’ from knowing exactly how to manipulate your new plug-in(s) based on the advice of experts. 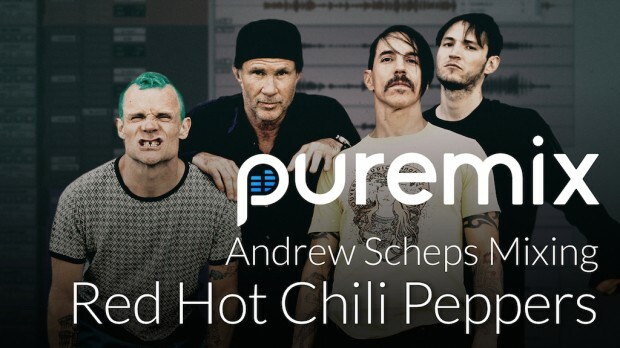 This is your chance to see how Grammy-winning engineer/producer Andrew Scheps mixed the legendary rock band Red Hot Chili Peppers’ song Pink as Floyd. Learn how Grammy winner Ryan Hewitt mixes the pop-punk superstars Blink 182. Building on the foundation and starting point from Ryan’s Mixing Template Tutorial, in this tutorial Ryan walks you through his mixing process step by step revealing his techniques and workflow for creating a killer mix. Andrew Scheps teaches you what is happening to your audio when it distorts and how to use that knowledge to your advantage. See how Andrew uses distortion to create interesting sounds and make elements sit into, or jump out of a mix. This entry was posted in DontCrack, Video and tagged Andrew Scheps, Carlos Bedoya, Darrell Thorp, Future Elevators, Mixing tutorials, Puremix, recording tutorials, Ryan Hewitt. Bookmark the permalink.